Rhonda asked if I had seen the SkyNews magazine. It was in the mail. Ho ho. All right. A bright point in the week. 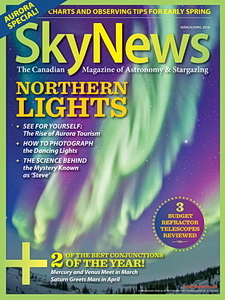 The theme of the issue is aurora. 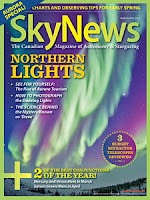 There are pieces on astro-tourism and how to photograph the northern lights. There is also an article on the phenomena known as "Steve." Awesome colourful photographs. I look forward to reading the item on entry-level refractors. That'll help when rookies ask about a starter 'scope. Showed Rhonda Matt Quinn's beautiful photograph of the Geminids over a small island on a frozen lake in Algonquin park.